How Cold is Too Cold to Walk the Dog? How cold is too cold to walk my dog? Unfortunately, there isn’t one perfect answer for this. I don’t 100% buy the whole “if it’s too cold for you, it’s too cold for your dog” theory. And no matter how cold you feel, your dog still needs exercise during the winter. After talking to a few veterinarians in Elmhurst and Lombard, I’ve come to a few generalized guidelines. It’s important to know how much the wind chill lowers the feel of the actual temperature. You should always go by the temperature with the wind chill included. If it is snowing and it is especially wet snow, it can be more uncomfortable. Body temperatures will lower much faster with any type of moisture. You should shorten your walk time in those types of conditions. Most healthy medium or large dogs can walk for 30-minutes if the temperature is above 20 degrees F. Smaller dogs should limit the walk to 15 or 20 minutes if temps are between 20 to 32 degrees F. If it’s below 0 degrees, no dog should be out for a walk. Your dog’s age, breed, and health are all major factors as well. Remember that puppies and elder dogs are much more sensitive to the cold weather because their bodies can’t regulate their body temps well. If it’s below freezing, these dogs should be taken outside to eliminate only. 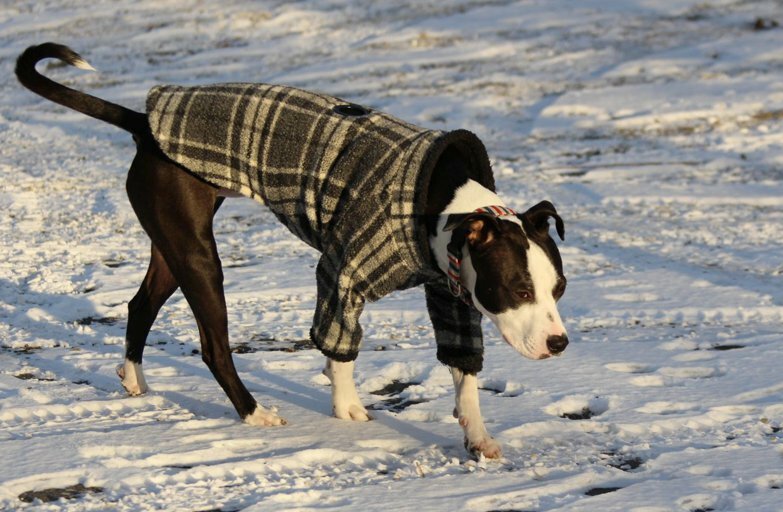 Different breeds have better tolerance to winter weather. While no dog should be left out in the cold alone, breeds like German Shepherds, St. Bernards, and Akitas have thick coats that help protect them from the elements. Small dogs and short-haired dogs need a sweater or jacket for the added protection and warmth. Any physical conditions like arthritis or hip dysplasia will only be aggravated by the cold. Keep pets with these conditions inside where it’s warm. The best piece of advice I can give you is to know your dog - pay attention to the signals they are giving you. If they are shivering, standing in a hunched position, lifting their paw(s) off the ground, or giving you verbal cues (like whining or barking); bring them inside. More serious signs are things like lethargy, weakness, or slowed breathing which are all signs of hypothermia. Keep an eye out for frostbite as well. The most common places this will effect is their tail, paws, and ear tips. If they are turning pale or blue, get your dog to a veterinarian. Bottom line, don’t let the cold weather keep your dog from getting exercise. You may have to limit your regular walk to only 5 or 10 minutes, but make sure to get them outside even if it’s just for a little bit when the weather is appropriate. If the weather isn’t cooperative, make sure they are getting sufficient potty breaks and find other activities indoors to keep their minds and bodies active.